We had such a fun Halloween!! Mary Mason dressed up as a princess, and Stratton was a frog. I even joined in on the fun and dressed up as a princess with Mary Mason (no picutures of me in my costume though). 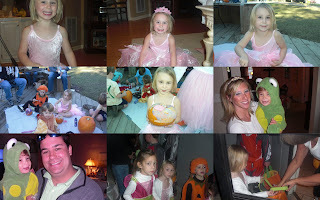 We got together with friends and had pumpkin painting, a hay ride, and trick or treating. Everything was going great until Mary Mason fell down and hurt herself, and then we had to cut the night short and go home to clean her up. We didn't get to finish trick or treating in our neighborhood, but we had a great night anyway. 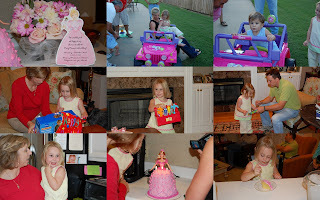 So it's been about 3 weeks since Mary Mason got her Barbie Jeep for her birthday from Uncle Bubba (Matthew). She wouldn't ride it the day she got it, and kept telling me she was scared of it. Mason took her outside Friday afternoon and talked her into climbing in. Once she hit that pedal, she had a smile plastered across her face. I don't know who had more fun, Mary Mason or her passenger. Stratton loves playing with the radio and really wants to drive. If you live on or near our street, watch out for the newest driver in the neighborhood. A few weeks ago, we piled up in the car (3 adults & 5 children) and headed to Cedar Hills. The kids had a blast!!! 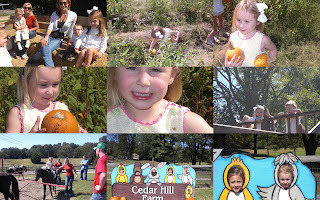 We all had a picnic, went on a hayride and to the pumpkin patch. They rode ponies and a train, and saw all kinds of animals. The weather was perfect and we all had a great time! This is the new swingset MM got for her birthday. She has played on it everyday that it hasn't been raining. Both the kids have such a good time on it. Mary Mason's 3rd birthday was on October 6, a few days after her party. On the mornings of their birthdays, I always fix them cinnamon rolls with a candle. Here's MM blowing out the candle on her birthday cinnamon roll!! Finally a few pictures from Mary Mason's 3rd Birthday party. She had such a good time. She got a Barbie Jeep from Uncle Bubba aka Matthew, a set of Handy Manny tools (she LOVES to fix things), and a new swingset. I can't believe she's already 3 (she acts like she's 23), and I can't wait to see what the next year brings! !